The Estero Padre Ramos Nature Reserve is a paddler’s delight. This 22,000 acre wildlife refuge provides endless opportunities for rambling exploration, bird-watching, swimming, hiking, and sea kayaking to your heart’s content. 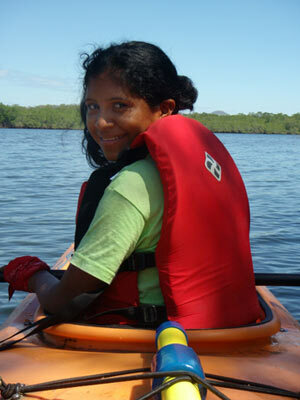 During this adventure, you can learn to kayak or just enjoy this mangrove estuary’s many splendors. Glide along in search of birds and sea turtles. Hike to a vista of the beach. Laze in the shade from the afternoon sun. Stretch your legs. Swim in the gentle waters of the Pacific. No matter your desire, you will be surrounded by an open coast, lots of fresh air, and the peaceful rhythm of lapping water to clear your mind and revitalize your soul. No experience is required, since we offer instruction for all ages and skill levels. We have no doubt that this voyage will leave you wanting more of the splendor and beauty of Padre Ramos Estuary & Nature Reserve.